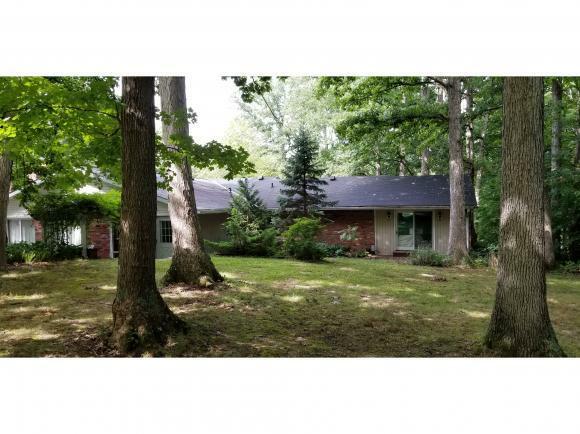 Peaceful Wooded Location close to everything!Stocked Fishing Pond & Workshop in Det Garage. Stately Trees Stand Guard Over this Spacious Brick & Frame Ranch. Extreme Landscaping accents this custom built family home-5 Bedrooms, 2 Baths, plus an office. Hot Tub to rear surrounded by wood decking. Detached 2 Car Oversized Garage. Paved Driveway. Seller offers 1 yr Choice Home Warranty. Sprawling One Floor Living! New to the Market!Per Assessor's Cards, Deeds, & Surveys the Acreage is 3.93 Ac (3.02 Ac + 0.91Ac) Easy to Entertain Here!